The Centers for Medicare & Medicaid Services (CMS) announced a host of new Medicare costs for 2016. Among them were the highly anticipated Medicare Part B 2016 premiums, Income Related Monthly Adjustment Amounts (IRMAA), deductible and $3 monthly across the board surcharge. The Social Security Administration had already released its decision that there will be no Social Security Cost of Living Adjustment (COLA) increase for 2016. As a result, by law, most people who are currently receiving Medicare Part B benefits will be “held harmless” from any increase in premiums and $3 monthly surcharge in 2016. Those folks will pay the same monthly premium as last year, which is $104.90. Regardless, many others will pay more. In the face of the Medicare hold harmless provision, all other Medicare recipients were going to have to absorb the entire Medicare Part B cost increase for 2016. It was estimated that it would result in a 52% Medicare B cost increase to all of those who were not held harmless. The recent federal budget agreement brought down the magnitude of that increase substantially by instituting much lower premium growth and funding the difference with a $7.5 billion Treasury loan. It is anticipated that the loan will be paid back over a five-year period by adding a flat-rate $3 monthly surcharge to all of those beneficiaries not held harmless in 2016. In the future, when there is a Social Security COLA, all other beneficiaries will pay a higher base premium and the $3 monthly surcharge as well. 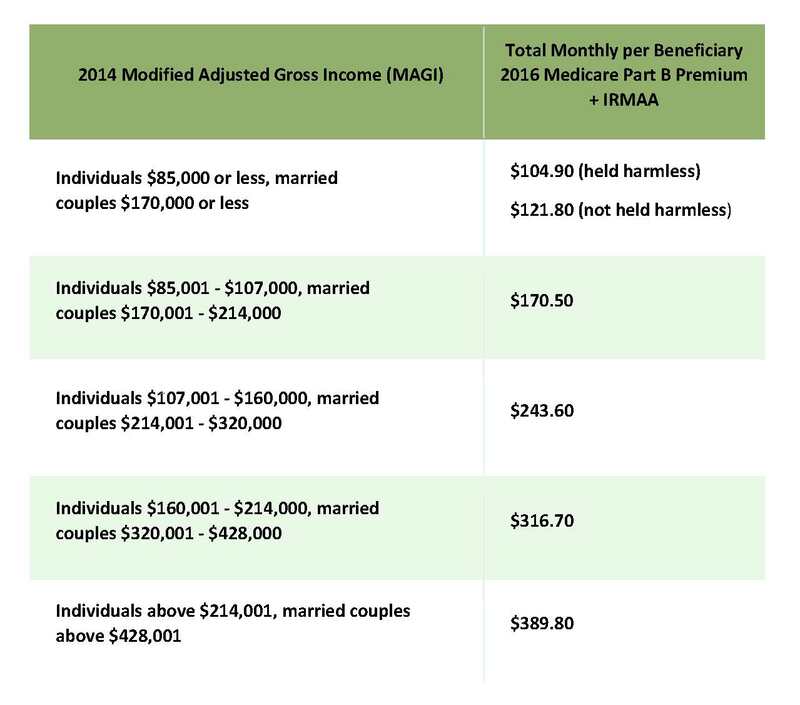 The following table shows the newly-released Medicare Part B premiums and IRMAA 2016 payments. Remember that the 2016 Medicare Modified Adjusted Gross Income (MAGI) brackets are based on the tax return two years in arrears, which is 2014.
trend, as well as the highest and lowest tiers, are unchanged. In total, all of those subject to the higher 2016 Medicare Part B monthly cost will see a 16% increase for this one portion of Medicare alone. CMS also announced that the annual deductible for all Part B beneficiaries will be $166.00 in 2016, a 13% increase over 2015. Part B deductibles are not subject to the hold-harmless provision and are therefore paid by all Medicare beneficiaries. • Shop smart for Medicare Part D prescription drug coverages and Medicare Part C or Advantage plans during annual enrollment going on now through Dec. 7. 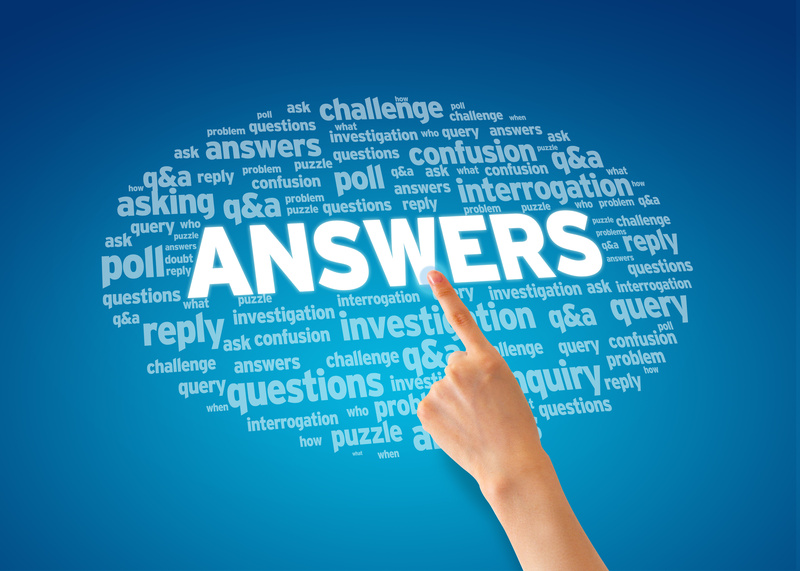 • Review and respond the Social Security annual Medicare Part B IRMAA notice in a timely fashion. Many people qualify for a reduction based on a change in circumstances. • Consider incorporating tax-free retirement cash flow into their retirement planning strategy.